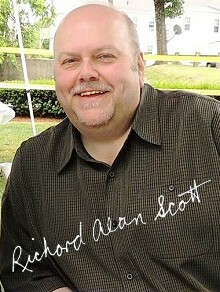 Richard Alan Scott is an American horror writer. I have not only learned a thing or two about what fans are into and what they prefer by being on panels, but also a great deal about good or trending literature that I was unaware of. Fans who are fellow authors have done a great deal to influence me the most, whether complimenting how I'm on the right track, or suggesting how I may return to it when I'm astray. A fan who had written about my work on a social network site said something to the effect of "you've got to check out this guy's work, he has the best technique I've ever seen." Whether that came from someone "qualified" to make that statement or not, it was from a reader and it was encouraging at a time that I really needed a boost. The Exorcist by William Peter Blatty, Ghost Story by Peter Straub and Queen of the Damned by Anne Rice. Those are the three that made my eyes fill up with stars; the three that set me on the course I would follow. I want my work to have the realism, terror and timeliness of the Exorcist, and the sheer creativity and scope of the other two. Even down to mechanics like Chapter and Section Titles, you can't top them. Stephen King's The Stand, Salem's Lot and The Shining are in that same league for me; actually a league of their own. An agent once admonished me for not naming more contemporary Horror authors re: impact, and I asked him, "So tell me, who are these people, with that level of influence right now? Name them, please." I know a few through the writing community, but commercially based and that widely successful, he could not. From film all I can say is that Kubrick is never far from my head when I write. Thirty years ago I would have said John Lennon without batting an eye; but in my maturity (ahem) I'd have to say Michio Kaku or Neil Degrasse Tyson. My thirst for scientific knowledge has become unquenchable. Oh, so many. Any of the Kardashian or Duck Dynasty idiots. And almost any Conservative Republican you can name. I used to respect some of "the loyal opposition." Not anymore. The rational, bright ones are out there, but get little air time. I thought long and hard about this. Ultimately, I'd have to say my Ipod Nano. Music has kept me company since I was a toddler playing in my bedroom. As long as I have music, my imagination is triggered, and I am never alone. It would mean everything to be able to contribute to the coffers of my family. But my true goal is to get my writing before as wide an audience as possible. I simply want other human beings to be able to receive my communications, in the hopes of making them think or perhaps even altering or enhancing their perspectives about life. It's all I ever dream about. If you ever see me self-publishing or just throwing my work into Amazon, you'll know that Richard Alan Scott has exhausted every possible means of traditional or independent publishing possible. The obstacles to reaching as many people as I can are nearly insurmountable. When my brain functioning cuts out, and if no alternative then exists in science or technology to continue my brain function, please know that then and only then is when I'll give up trying to communicate. Looking back at things that grew out of blank paper, registering genuine surprise and thinking, did that come out of me? Born: December 1, 1956 in Woonsocket, Rhode Island. Woonsocket is a diverse city, first populated by French Canadian mill workers, and along with parts of the Louisiana Bayou, one of the only places in the U.S. where French is still spoken in the street. Resides: Rural Northwestern Rhode Island. The Aftertaste Published in Walls and Bridges (anthology) from Millennial Concepts. Resurrection Cemetery Published in the Sonar4 Science Fiction and Horror Ezine. Assault at Innsmouth Published in Shroud Magazine (Issue #7). Stoker's Benefactor Published in Albedo One (Issue #37), Ireland's Premiere Magazine of Horror, SciFi and Fantasy.